Hull and Larson’s musical mansion has many rooms, reflecting their encyclopedic knowledge—and command—of folk, pop, world, jazz, and classical musics. Here you’ll find Appalachian tunes, ragtime, Irish airs, Western swing, Brazilian melodies, Tin Pan Alley, and original compositions drawing on these influences and more. All of this is played on a variety of vintage instruments, including acoustic arch-top guitars (of which they are among the few remaining practitioners). They also play National resophonic instruments and, of course, flat-top guitars. 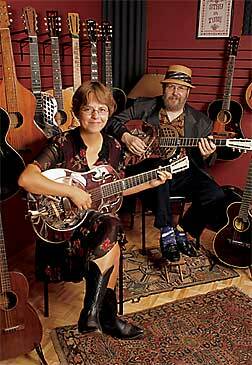 Both Dakota Dave and Kari are veteran musicians. Called (by folk legend Dave Van Ronk) “one of the best guitarists in the world,” Dave has recorded four acclaimed solo albums. On stage or in the studio, he has performed with Van Ronk, Utah Phillips, Doc Watson, Robin and Linda Williams, Paul Geremia, Spider John Koerner, Sally Rogers, Butch Thompson, Peter Ostroushko, Garrison Keillor, and Norman Blake. Kari comes out of the San Francisco Bay-area acoustic music scene. She has also performed in rockabilly bands, Jewish and Italian groups, and Baroque ensembles. Hull & Larson performed together for over six years.